Established in 1804 by Napoléon Bonaparte, the Pére-Lachaise cemetery in Paris contains the remains of thousands of celebrated artists, writers and musicians, including Edith Piaf, Max Ernst and Oscar Wilde. 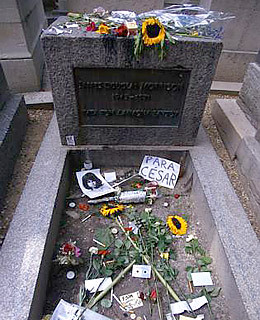 But the cemetery's most visited grave belongs to American rock legend Jim Morrison, who died in Paris on July 3, 1971, of heart failure. On any given day, hordes of tourists surround his tombstone, which has been covered with graffiti by overenthusiastic fans and once featured a bust of Morrison before vandals claimed it as their own. Nearby tombstones have been defaced as well  with arrows pointing visitors toward "Jim"  though cemetery staff have wiped them clean and erected metal barricades to curb unauthorized tributes. Read "A Postcard from Jim Morrison's Grave."